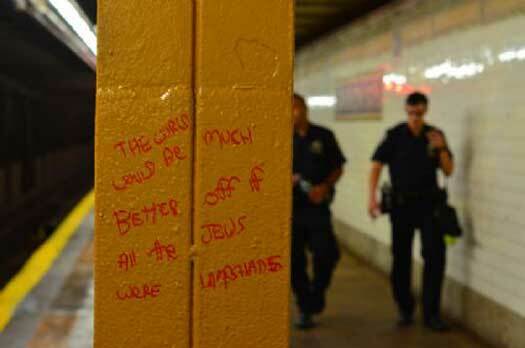 Graffiti at the Kingston Ave. subway station: "The world would be much better off if all of the Jews were lampshades." Transit officials say anti-Semitic graffiti incidents are the top subway bias crime investigated so far this year by the New York Police Department. 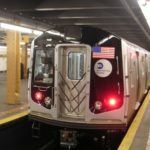 In a report to the MTA board, Transit Bureau Assistant Chief Vincent Coogan said 22 of 31 hate crimes that happened in the subway targeted Jews, mainly through graffiti. Last year, over the same period, only seven bias crimes total in the subway were reported. But this year, a rash of swastikas and comments that advocate the killing of Jews have been spotted on train cars and in stations. Click here to continue reading at the NY Daily News. The word antisemitism should be changed.It should be called a hateful act by the mentally challenged.Evidence should be collected and prosecution should follow.But publicity should minimal if at all. The Rebbe told us: If Israel gives away land that Hashem helped them win in a miraculous way during the June 1967 SIX day war this will put the lives of Jews all over the world in danger. On a positive note: Even though The fight for Sh’Lemus Ha’Aretz seems difficult. We need to remember what it was like to fight for yiddishkeit in the Former Soviet Union (the 2nd most powerful country in the world). And with the Rebbe’s guidance we won. & now the Soviet Union only exists in history books.